Do you recognize this radio? 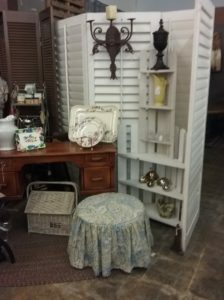 Have you ever wondered upon some truly vintage item at an Estate Sale and thought it way over priced? I want to tell you a little about how I go about pricing.This rare vintage raido was an item for sale at a recent estate sale I hosted. When I find a vintage, antique, or rare items I do as much research as I can to give it a fair value. I usually start with a Google search and compile as much history as I can. I look on eBay for comparative items and on Etsy,and other like sites, I take enough time when researching to justify the means for my price. I know we are all looking for bargains, but when an item is rare, vintage, or antique, I feel it deserves its value. I always stay below retail while continuing to honor the previous owner and the item. When a family is having an estate sale, it’s usually due to a death in the family, however sometimes it may be for the purpose of moving a loved one into an assisted facility, or a smaller more manageable home, what ever the reason for the sale my objective is to help the family. The next time you go to a sale of someone’s life loved treasures I hope you find something wonderful , if you feel it’s overpriced ask the person hosting the sale for an explanation as to how they came to that price,I’ll bet you’ll understand the value of the item much better. Whether it’s a rarity , the craftsmanship, or the age that it gets its value from you’ll take it home and it will become one of your life treasures now.